About the artist: Franca Donato is the sixth daughter of an aging architect from Mantua. In his haste to be rid of his last unwed and troublesome daughter (and make room for his mistress), he agrees to marry her off to a wealthy Venetian merchant. The merchant envisions a wedding at sea mainly to avoid the plague. The wedding party and guests set sail and are besieged by a storm. The ship of wedding guests manages to return to Venice; but the merchant is lost at sea. Franca is stranded on the shores of Trimaris by the captain who turns to privateering after the death of his employer. She turns to words, the needle, and scribal arts to make her way in the world. 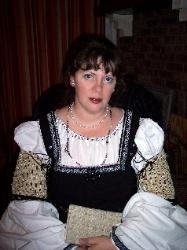 Protege' to Mistress Katherine Angelique d'Artois du Berry. Specialty: Personal affinity for late period Italian styles including white-vine interlacing for illumination and uncial, bastarde, and italic calligraphy scripts. July 2007 Awarded Coronet’s Acclaim at Summer A/S for Tapestry Cartoon. October 2007 Won Baronial Word List Poetry Competition at Harvest Festival. February 2008 Awarded Crown's Acclaim at Winter A/S for Das Gluckshaus board. August 2008 1st place, Trimarian Scribe-a-thon, Reign of TRM'sMittion and Rosalinda. May 2009 Won Baronial Word List Poetry Competition at Oldenfeld Investiture. May 2010 2nd place, Fancy Scroll Competition, Reign of TRM's Thorstenn and Zephrine. Franca keeps a web page at this site.